Looking to treat yourself with something delicious and nutritious? 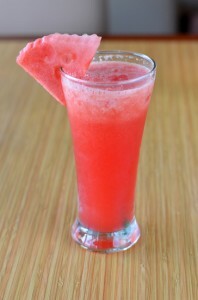 Try this refreshing watermelon smoothie. It’s perfect for dessert or to quench your thirst on a hot summer day. With watermelon being the star ingredient of this smoothie, let’s touch on a few of the health benefits before getting to the recipe. Watermelons are loaded with important antioxidants. Rich in vitamin C, vitamin A (via beta-carotene), and the carotenoid, lycopene, all of which team up and neutralize free radicals throughout the body. Watermelons are a good source of energy producing B vitamins and potassium and magnesium. Here are a few of the ailments watermelons have been shown to improve: asthma, arthritis, atherosclerosis, diabetes, colon cancer, prostrate cancer, and protection against macular degeneration. Quick note on the tropical watermelon smoothie recipe. You could use fewer, or forgo all together, the ice cubes and use frozen mango and pineapple instead. It’s completely up to you. Enjoy! Place the ingredients into your high speed blender and blend for 30-45 seconds or until the desired consistency is reached. Try and like this tropical watermelon smoothie? Please leave a comment below and tell me all about it. Happy Blending!